Learn how the Interior of Alaska is defined by the people, plants and animals that live between the Alaska Range to the south and the Brooks Range to the North! 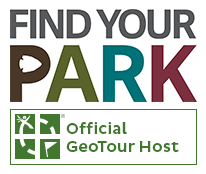 For 100 years, the National Park Service has preserved America’s special places “for the enjoyment, education, and inspiration of this and future generations.” Celebrate its second century with the Find Your Park GeoTour that launched April 2016 and explore these geocaches placed for you by National Park Service Rangers and their partners. Come under the "Spell of the Interior" as you tour our world class exhibits. Not only beautiful but informative as well, the friendly and knowledgeable National Park Service staff at the Alaska Public Lands Information Center have answers to all your questions about the recreational opportunities on the millions of acres of Alaska's public lands. You can also find brochures, maps, free WiFi and telephone, daily vacancy listings, and local driving tours in this building. This cache is only available during building hours. Open 7 days a week year round. May 10 - Sept 26 (8am-9pm). Note: The cache is hidden in an area of the exhibits that is accessible to the public. Please respect the barriers that protect fragile exhibits.